I’ve had the pleasure and opportunity of coaching a large number of bodybuilders through training and nutrition programs both in person and online. With that said, I’ve noticed a lot of similarities from bodybuilder to bodybuilder, when it comes to the style of training they implement, and the types of programs they follow. Some of which may be limiting the physique and performance related results they desire. In this post I’m going to supply those of you who use more of a bodybuilding routine, with a “challenge” to build upon areas you may be neglecting, that can help you with your training efforts. Complete the following workout just once or twice a week. After you do this for about thirty days, start incorporating some of these movements into your typical training program as you should grow to like at least one of them. This day will have three sections. 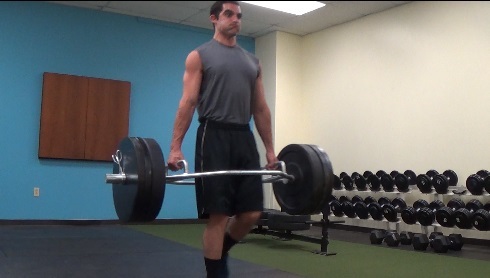 A loaded carry: Farmers walks, suitcase or overhead carries, yoke walks etc. A muscularly demanding, conditioning, lower body exercise that involves locomotion: Prowler or plate pushing, sled dragging, hill sprints, backwards runs, stairs, etc. 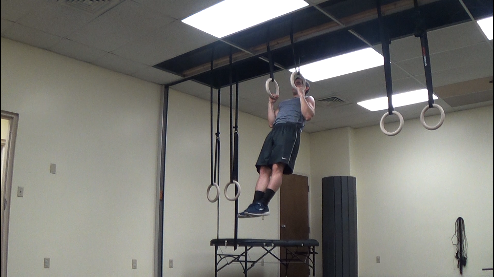 A closed chain, upper body pulling movement: Pull-ups, chin ups, inverted rows. 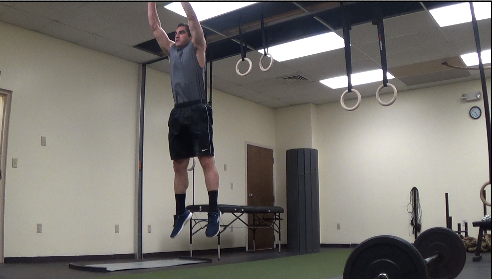 An explosive, jumping, lower body power movement: Vertical jumps, broad jumps, box jumps, depth jumps, jump squats etc. 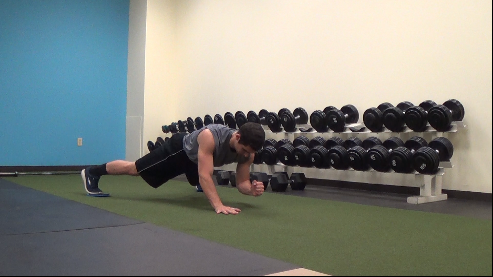 A closed chain upper body pushing movement: Push-ups, handstand push-ups, dips, etc. 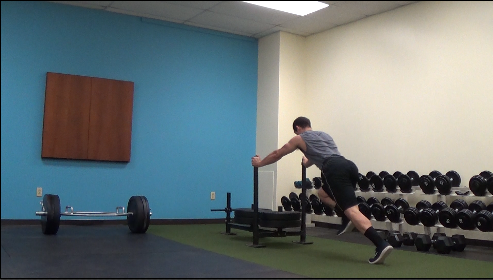 A single leg hip hinging movement: Single leg deadlifts, single leg good mornings, single leg hip thrusts, etc. Something you’re not good at or unfamiliar with. For example, an animal, baby, gymnastics, ground based, or closed chain movement: Monkey walks, lizard crawls, rolling patterns, spinning in circles, cartwheels, duck walks, forward rolls, back flips, etc. Use minimal to no rest between exercises, and 90-120 seconds rest after each round. Try to increase either the weight used, rounds completed, or distance traveled, or reps used over time. Never sacrifice form for quantity. Try to increase either the weight used, rounds completed, or reps used over time. Play around with an unfamiliar movement (animal, baby, gymnastics, etc.) or a combination of them, for about five to ten minutes, resting as long as you want or need, in any way you would like. By performing loaded carries, you can improve many aspects of your current training program, as well as other areas of your physique, performance, and mind, that you may have never thought of. This can be important as weak or neglected gluteus medius muscles may contribute to certain types of knee pain (Rathleff et. al 2014; Khayambashi et al. 2014), back pain (Cooper et al. 2016), hip injuries and pain (Suetta 2004), or even the excessive knee valgus (caving) you see with exercises like squats (Cashman 2012). As a tool for teaching them to get tight, brace, and stay stiff through their “core” musculature, all while breathing and moving simultaneously. As the weight is trying to distract or pull their shoulders and elbows out of their sockets, and therefore it challenges muscles like the biceps and shoulder rotator cuff muscles to keep the resistance from doing so. As an anti-lateral flexion exercise for muscles like the external oblique and quadratus lumborum. Especially when performing things like suitcase or one arm carries. In sum, I used loaded carries in this challenge for the training effect they have on the entire body. This includes but is not limited to grip strength, trap and abdominal development, mental toughness, work capacity, and conditioning. It’s a rare sight to witness bodybuilders performing a muscularly demanding exercise, that involves locomotion or moving from one place to another. While this type of activity is not absolutely necessary, it doesn’t mean that a large number of them couldn’t benefit from this portion of the challenge. When programming for a client with mobility restrictions, lower back pain, or knee issues, many types of lower body conditioning exercises like this (sled pushing and pulling) can be a way to train the legs with less joint stress, and without making certain injuries worse. One reason I’m having bodybuilders perform something like prowler pushes, sprints, or sled drags, is to double check their mental toughness, and/or to add some “excitement” to their training. Your lungs will scream after this movement. This high demand on your cardiovascular system may help improve your bodybuilding routine or program, by improving your recovery between normal lifting sets, leading to better overall resistance training sessions. The prescription of this exercise can lead to increases in things like hypertrophy, strength-endurance, power, endurance, and strength, all at once. I understand that traditional resistance training produces repeated muscular contractions, which generates an elevated heart rate, just like aerobic exercise. (Hrubeniuk et al. 2014). Steele et al. (2012) even contended that performance of resistance training to failure will produce significant improvement in cardiovascular fitness that occurs through physiological adaptations such as up-regulation of mitochondrial enzymes, mitochondrial proliferation, conversion towards a type IIa phenotype, and capillarization. Pulling weights, cables, or bands down to your body (open chain), is different than pulling your body up to a bar, rings, or any other piece of equipment (closed chain). Generally, most bodybuilders avoid the latter, and usually without good reason. That is why this challenge consists of this particular type of movement. With that said I’m going to break this down into two categories. 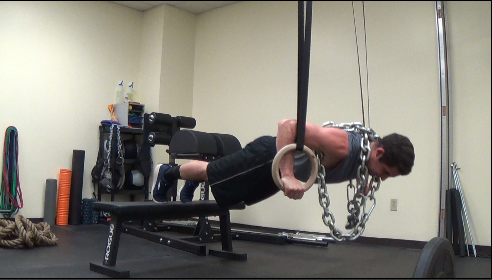 Closed chain upper body vertical pulling (CUPV), and closed chain upper body horizontal pulling (CUPH). The inverted row elicited the highest activation of the latissimus dorsi muscles, upper-back, and hip extensor muscles. The inverted row also showed that the lower activation of the lumbar erector spinae (lower back) muscles, corresponded to the lower spine load measured. The standing bent-over row produced large activation symmetrically across the back, but it produced the largest lumbar spine load. In simple terms, although higher muscle activation and a greater amount of spinal loading can be beneficial when performing things like bent over rows, if you wish to spare your lower back, while still eliciting a large amount of muscle activation to the lats, the inverted row is a great option. The point of this challenge is not to steer you away from exercises like bent over rows, but to remind you that incorporating both can be advantageous. They believe lat pulldowns can work the same muscles just as good, if not better than pull-ups. They are harder than they expected, and don’t want to take the time to get better at them. If you didn’t notice, all of the bullet points above are either not valid or excuses, besides number three, where you can use assistance from a band, and /or work your way up to them. But since I don’t want to get off topic, let’s just stick to the explanation of why I included this movement in the challenge. Variations of the pull-up challenge your grip strength, arms, back, and even your abdominals depending on the technique you choose to use. They can keep body composition in check if you make sure you’re always able to do them. For example, Sánchez-Moreno et al. (2015) reported that anthropometric dimensions seem to influence differently on both lat pulldowns and pull-ups, depending on the strength indicator evaluated. In simple terms, they showed that the leaner you are, the better your pull-up performance will be. They are a skill, require body control, and are extremely rewarding both mentally and physically, as you get better and better at them. The use of closed-kinetic chain exercises for the lower body have been shown to improve outcomes in rehabilitation, lead to greater levels of electromyographic activity (muscle activation), and improve stability and proprioception when compared to open chain exercises (Zhang et al. 2014; Lee et al. 2013; Ucar et al. 2014) Therefore it may be reasonable to conclude this is also case when it comes to closed chain upper body exercises as well. Even Doma et al. (2013) looked at the kinematic and electromyographic comparisons between chin-ups and lat pull-downs and concluded chin-ups appear to be a more functional exercise. In the end, all types of vertical pulling (lat pulldowns, pull-ups, etc.) and horizontal pulling (bent over rows, inverted rows, etc.) should be part of your training program at some point or another. Since closed chain upper body movements are often neglected, add them in for this challenge. The exercise you select for this part of the challenge, should be one that will allow you to take advantage of the stretch-shortening cycle, to produce an explosive movement. Therefore, vertical jumps, broad jumps, box jumps, depth jumps, jump squats and the like can be included. As a bodybuilder, you’re probably thinking that you don’t need include any explosive, plyometric, or jump training in your programs. Additionally, you may have never consciously completed any, in any routine, your entire lifting career. However, this method of training may bring you closer to your potential when it comes to increasing strength, muscle mass, power output or decreasing your chances of injury. With that said, here are the two main reasons I have included this movement into the challenge. The incorporation of lower body plyometrics may help reduce the risk of injuries (Voskanian et al. 2013; Chimera 2004; Carvalho 2014) and uncontrolled knee valgus or knee caving (Myer et al. 2006; Struminger et al. 2013) which is an often occurrence I witness in bodybuilders when squatting. The low rep range (5 reps total per round) is because I don’t want you to chase fatigue, but rather enhance neuromuscular coordination, drive, and create heightened levels of motor unit recruitment or muscle activation. With closed kinetic chain exercises like push-ups, dips, and handstand push-ups, your body moves while performing them. On the contrary, with open chain movements that involve pressing either horizontally or vertically (barbell or dumbbell bench press, dumbbell, cable, or band resisted fly’s, overhead presses, machine based exercises), the object moves. Like I mentioned above, the majority of bodybuilders who approach me rarely (if ever) perform the former closed chain upper body movements. Especially when this comes to “pushing movements” like push-ups or handstand push-ups. This is just one reason they are part of this challenge. Your scapulae or shoulder blades, are locked into place during most horizontal pressing movements like the bench press. This doesn’t allow for the full scapular movement of the shoulder while pressing. The push-up trains the serratus anterior which protracts and stabilizes the scapula, as well as assists in upward rotation. Research has linked shoulder and neck disorders to impairments in serratus anterior activation (Castelein et al. 2016). It has also shown that if normal scapular movements are disrupted by abnormal scapular muscle firing patterns, weakness, fatigue, or injury, the shoulder complex functions less efficiency and injury risk increases (Escamilla et al. 2009). With most typical bodybuilding chest and shoulder exercises, you’re either lying on your back or seated. This makes the movement supported, which takes out much of the anti-extension core training affects you receive from things like push-up variations. This is assuming you avoid the extremely common technique of excessive anterior tilting the pelvis or arching of the lower back while doing them. Again, almost every bodybuilder lacks anti-extension core control and/or strength. They’re so used to sticking their chests out with chest exercises, that they tend to hold tension on their hip flexors and low back instead of their core and glutes when it comes to most core exercises like push-ups. However push-ups done with good technique can help with this issue. Like every other exercises in this article, make sure you nail technique before attempting this challenge. Although the literature shows different amounts of muscle activation in certain body parts when performing things like push-ups with different palmar widths (Kim et al. 2016) and whether you choose to use stable or unstable surfaces (Borreani S et al. 2015; Calatayud et al. 2015) they all basically target the same areas just to different degrees. Therefore, you can use all styles of them in this challenge, or get crazy and perform one of the 150 I show here. I especially like this one at minute mark 9:40 here. So there is no confusion, I’m not saying to only use closed chain upper body pushing exercises in your programming. Just that they seem to be neglected which is why they are part of this “challenge”. We aren’t limited in our application, but many are in their thinking. Use all forms or pressing that you are willing and able to perform. Single leg deadlifts can help many bodybuilders with more areas of their training that they either unaware of, or care to admit. With that said, here are a few reasons this exercise was included in the challenge. Since your base of support is narrowed in the single leg deadlift (standing on one foot instead of two) you’re hip stabilizer muscles are targeted to a greater extent. Therefore, even though you won’t be able to use as much weight overall with this exercise compared to bilateral or double leg exercises, and it would make sense that gluteus medius muscle activity is higher than normal when compared to double leg movements. (Lubahn et al. 2011). This can be useful, as like I’ve said before, weak or neglected gluteus medius muscles may contribute to certain types of knee pain (Rathleff et. al 2014; Khayambashi et al. 2014), back pain (Cooper et al. 2016), hip injuries and pain (Suetta 2004), or even the excessive knee valgus (caving) like you see with exercises like squats (Cashman 2012). Done with a proper hip hinge, this movement teaches you to move from your hips, and therefore crushes the glutes and hamstrings while sparing the spine. 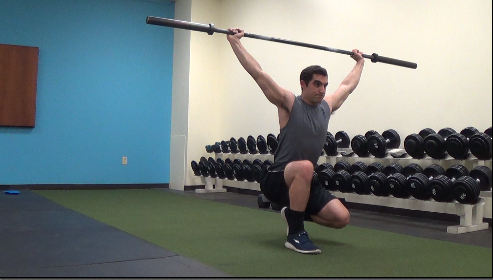 There is more demand in the frontal and transverse planes, and you will quickly feel this as you perform the exercise. In simple terms, you will be fighting not to fall over in every direction. Besides training each side similarly, compared to the possible favoring of one side when performing double leg movements, the single leg deadlift highlights which side of your body may be stronger and/or weaker, and/or movement differences from side to side. As a coach it’s also a great assessment tool. Additionally, since you’re training both legs individually, you may notice it requires at least twice the amount of time to complete this movement when compared to double leg exercises. Usually even longer, as it forces you to control the movement in order to maintain your balance. What this means is that metabolic demand goes up, and you will be breathing harder for a longer period of time. 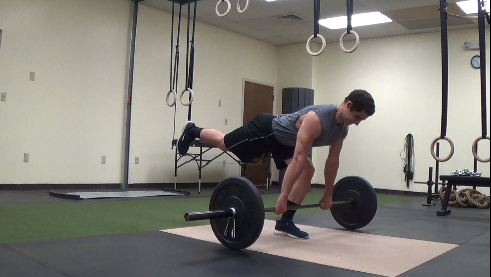 Even though you have many exercise options to choose from with this part of the challenge, I’m going to finish of this article by talking about anti-extension core based movements (like the backwards hand walk plank-ups you see me performing in the video) for now. The reason for this is, when working with bodybuilders I regularly notice their anti-extension core strength, or their ability to resist lower back arching, is often weak, neglected, and/or trained improperly. Most people do not understand what it means to keep their spine in a “neutral” position, or how to control the rib cage and the pelvis together. Therefore they tend to use an arched lower back position when performing anti-extension core exercises like ab wheel rollouts, push-ups, and planks. The main reason I’m mentioning this, is because when excessive low back arching or flaring of the ribs occurs, it takes the stress away from your abs (the area you’ve most likely intended to target), and places it onto your lower back and hip flexors. A great number of bodybuilders tend to stick their chests out when doing most exercises (think bench press, rows, pull-ups, dumbbell pullovers, etc.). Even though this may help with things like the bench press, it will be less optimal if they (as they often do) carry this over to most other exercises like push ups, deadlifts, squats, and more. Most people in general are either mis, dis, or not informed about what position they should be in to best target their anterior core. Therefore they either lack the ability (or don’t understand) what it means lock the ribcage to the pelvis. By strengthening your anterior core and learning to control your pelvis and rib cage together, you will not only be stronger with most exercises, but increase core activation, take stress off of your lower back and other unwanted areas like the knees and feet, mitigate the potential of future injuries (Zazulak et al. 2007), while at the same time learn to move better ball and socket joints like the hips and shoulders. Any more questions just ask me here on Facebook and I will take the time to answer them.